Supreme Janitorial Service is your Jacksonville cleaning company. You can trust us to get the job done right and to make your business or job site look fantastic. 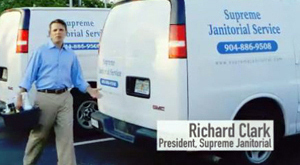 We have been serving the Jacksonville community with supreme cleaning since 1968. Customization—Every client that we work with is treated as an individual with specific needs. Every estimate that we provide is based on the specific requirements of our clients. That means that you will get the service that you want the way that you want it. Consistency—Every member of our professional janitorial maintenance team goes through rigorous training and evaluation to learn and perfect good work habits. We reward our employees for performing their best for you. We hold meetings to discuss the standards, equipment, and products related to each project before we ever begin work. Cooperation—We believe there is a direct relationship between the service that we provide our clients and the communication between our company and yours. We will work with your unique situation and deal with special circumstances in a way that always respects your wishes. All candidates must agree to a drug test when hired and to subsequent random checks. All of our employees wear uniforms. Are you ready to get the supreme cleaning that you need for your office space or jobsite? Contact Supreme Janitorial Service today! We are proud to serve Jacksonville, Jacksonville Beach, Ponte Vedra, St. Augustine, Fernandina, Amelia Island, Orange Park, and Nocatee, Florida.